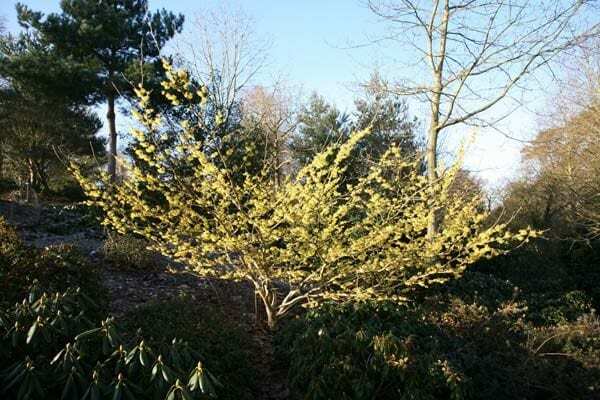 In winter, this deciduous shrub has clusters of sweetly scented, sulphur-yellow flowers clinging to bare twigs. In autumn, the bright green leaves turn spectacular shades of yellow, orange and red. 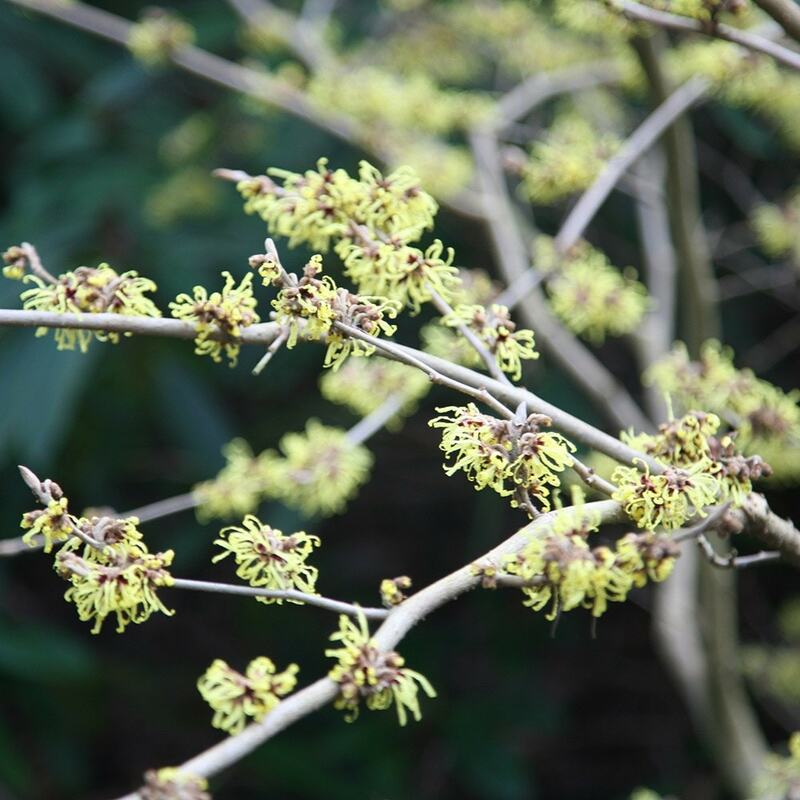 The tiered branches of this award-winning variety of witch hazel contrast well with the vertical stems of dogwood. It is a lovely specimen plant for a sunny winter border or woodland edge, where its fragrance can be appreciated. The flowering twigs can be cut to perfume rooms in winter. Garden care: In early-spring remove any misplaced, crossing or diseased branches and apply a generous 5-7cm (2-3in) mulch of well-rotted compost or manure around the base of the plant. I have this in a large planter and it has just passed the flowering stage. They were glorious flowers an most unusual - a real eye catcher. Great plant, love the "flimsy" flowers. Original got broken in transit, 2/3 branches very badly damaged, it ended up with only 1 stem (Crocus were very good and quick about replacing it and didn't want the damaged one returned), with a lot of careful pruning and tlc, it survived. I have only given it 4* due to both plants being the same cultivar and labeled as such, but they are different in flower colour, subtle I admit, but one is acid lemon yellow the other is more golden yellow. Hamamelis mollis-planting before we get frosts? Hi, I received a gift of a Hamamelis mollis during the third week of October from your company. I am still trying to design my new garden and would like advice on how long I can keep my Witch Hazel in the original pot. My garden is still being laid out as we have just completed extending and refurbishing our new home. Would I be right in thinking that I need to get the plant out of the existing pot before we get any frost? I am not a very experienced gardener but am desperate not to let the shrub die. Many thanks Hazel. What plants would you suggest for a winter gift? I would like to send a present in November to someone who loves the garden - any suggestions as to what you could offer? (I previously sent one of your ornamental bay trees, which was very successful). 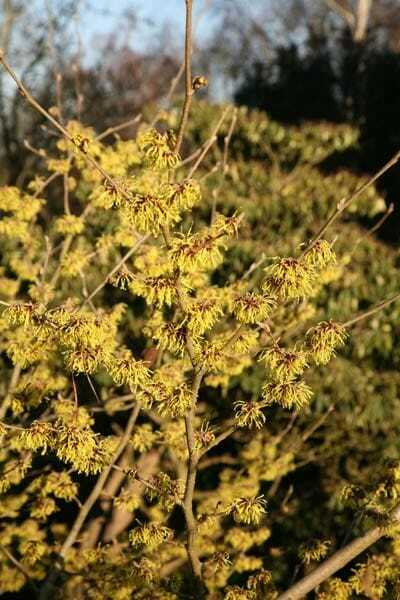 The Hamamelis we sell in a 2 or 3lt pot will be around 40cm tall, while those in a 12lt pot will be around 1-1.25m tall. Please can you advise on the height of the Chinese Witch Hazel when supplied?